Back in 2011, the Vietnamese government set an ambitious goal to ensure that by 2020 every student leaving school will have a strong grasp of the English language. The demand for English teachers skyrocketed and three years later Vietnam is still in great need of ESL teachers. Now’s the perfect time to start teaching English in Vietnam. During these reforms in education, Vietnam has become more accessible for native English speakers and such teachers are cherished throughout the country. Hanoi and Ho Chi Minh, formerly known as Saigon, are two of the most popular locations for English teachers in Vietnam. Located in the South and North parts of Vietnam respectively, the two cities have noticeably different cultures and climates. These cities, unquestionably, offer vastly different experiences. Read on to learn more and see which one will strike your fancy and win you over. The capital of Vietnam is the city that carries the torch of the Vietnamese spirit. Westernization is a lot less evident here, making it ideal for teachers who want to experience the original cultural side of the country. The city nightlife relies mostly on after-parties due to the midnight curfew, and they’re quite the unique experience. Don’t be misled, though. Students in Vietnam, both kids and adults, are not stuck in the past and enjoy interactive teachers who manage to create an enjoyable learning environment. Rising from the ashes of a city that had been devastated by war for almost two decades, Ho Chi Minh is the tiger of Vietnam. Today, it is a modern metropolis that has embraced western culture. The increasingly fast development of the city presents ever growing demand for teachers, with opportunity to work with a wide variety of students of all age ranges. The massive city may be a bit overwhelming at first, but adventurous teachers should feel right at home among the many cultural attractions to visit in Ho Chi Minh. Its’ rare geographic setting has provided Vietnam with just about anything you could ever hope to find: lush vegetation, vast and beautiful beaches, tranquil, isolated islands, and even soaring mountains. And the beauty of the country extends well beyond nature, to incredible cultural landmarks that still manage to preserve the ancient spirit of Vietnam. To the north west, there’s the town of Sa Pa with massive terraces just outside its borders. Locals grow rice, corn and vegetables the way they have for centuries, and that’s a truly fascinating thing to experience. While there, make your way to Ha Long Bay, which is part of the UNESCO World Heritage program. Its rocky outcrops that soar above the clear blue waters will leave you breathless. Also visit the city of Hue, which lies on the banks of the Perfume River in central Vietnam — it’s a must see if you are traveling up and down the country. The city was an imperial capital and has managed to preserve important symbols like the Thien Mu Pagoda, which rises 7 stories above ground to win the title of Vietnam’s tallest pagoda. Currently, Vietnam is one of the best countries in Asia for finding ESL work easily. The constant demand for teachers translates into reliable work opportunities and good pay. The breath-taking scenery and cultural richness only add to the attractiveness of the country. To help enthusiasts, LanguageCorps offer training programs for certificates required by the state. Program start dates span throughout the whole year. However, keep in mind that to ensure placement, you should apply at least two months before the start of your course. 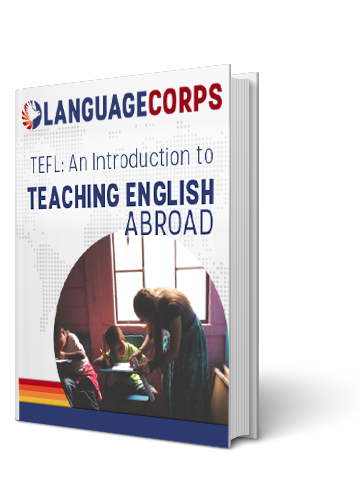 So, don’t lose time – sign up for a program to start teaching English in Vietnam!